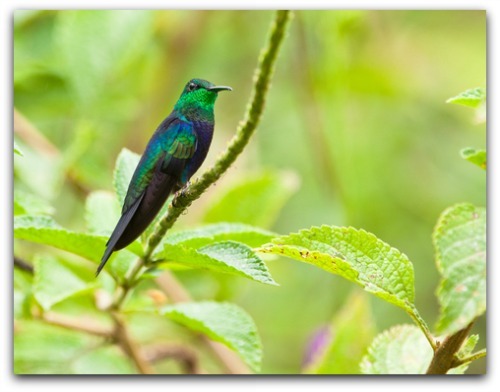 The Fork-tailed Woodnymph, also called Thalurania furcata, is a beautiful hummingbird. It’s found in South America. Unlike the Ruby-throated hummer that dominates North America, the Fork-tailed isn’t comfortable around humans. Just like many other flying jewels, though, it’s a territorial, solitary and aggressive bird. Male Colors: Glittering violet lines its belly. Upperparts are green and thighs are white. Throat is a sparkling green. Female Colors: Underbelly is a pale gray or white, with bronze-green plumage. Size: Small, about 3.5 to 4 inches long. Bill: Straight & black. Sometimes, it’s described as slightly curved. Tail: Female’s outer 3 tail feathers have white tips. Like all hummingbirds the Fork-tailed eats insects and nectar from flowers. It likes bright flowers it finds within shrubs, herbs, and trees. If others come into their feeding territory, such as hawk moths, bumblebees or other male hummers, they’ll aggressively chase them away. Tubular shaped, red flowers are their favorite as these tend to be the highest source of sugar nectar. Sometimes they hover over the flower to feed, while at other times they’ll hang on the flower. This South American hummingbird has a tongue that extends out through its bill at rate of about 13 x’s per second as it licks up nectar. The Fork-tailed Woodnymph will feed from hummingbird feeders provided by locals. As well, they use water fountains and bird baths as a water source. They can feed on insects by picking them off branches, catching them in flight or by snatching them from spider webs. Its habitat consists of a range from dense forests to edges of forests. It will also settle into semi-open areas with shade, such as gardens or plantations. The Fork-tailed hummingbird is solitary. They don’t live together or flock together. They simply mate and that’s the end of their “bond”. The male has no involvement with the nest or raising chicks after mating. In order to “court” females the male will perform a mating dance. It consists of a U-shaped flying pattern in front of the female in order to impress and attract her to him. After mating the female builds her nest. It consists of feather down, animal hair and plant fibers. These are woven together with spider webs. It’s a small cup shape. As the chicks grow the nest will expand to twice its original size. The female places her nest on a low, thin branch. Each nest will have two eggs. Once they hatch the female will protect her young for about 20 days. She feeds them by pushing regurgitated insects straight into their stomachs with her bill.